Following an Australian government edict in 1931, black aboriginal children and children of mixed marriages were gathered up by whites and taken to settlements to be assimilated. In Rabbit Proof Fence, award winning author Doris Pilkington traces the captivating story of her mother, Molly, one of three young girls uprooted from her community in Southwestern Australia and taken to the Moore River Native Settlement. At the settlement, Molly and her relatives Gracie and Daisy were forbidden to speak their native language, forced to abandon their aboriginal heritage, and taught to be culturally white. After regular stays in solitary confinement, the three girls scared and homesick planned and executed a daring escape from the grim camp, with its harsh life of padlocks, barred windows, and hard cold beds. The girls headed for the nearby rabbit proof fence that stretched over 1,000 miles through the desert toward their home. Their journey lasted over a month, and they survived on everything from emus to feral cats, while narrowly avoiding the police, professional trackers, and hostile white settlers. Their story is a truly moving tale of defiance and resilience. In the nineteen thirties, three young girls were taken from their Indigenous families in Jigalong, removed by the descendants of white European settlers on behalf of the Australian Government. Fifteen year old Molly is a muda muda, a child born from her Indigenous mother and white English father, a man who tends to the maintenance of the rabbit proof fence that stretches across the land. Often tormented by Indigenous children, the Australian government believe that children born of white fathers can be assimilated into white communities, toiling the land and provided an education. Molly, eleven year old Gracie and nine year old Daisy, all born to white father's are removed from their community only to begin the long, arduous and liberating nine week journey from the oppressive Moore River Native Settlement back to the Jigalong community. Where they belong. Australia has a turbulent and atrocious history of the treatment of our traditional land owners, the Indigenous communities that have endured at the mercy of white European settlement. The late Doris Pilkington has created a narration of her mother's story, born to an Indigenous mother and white English father, deprived of her community when removed from her land to be placed into government custody along with her younger sister and cousin. Throughout the introduction, the author discusses the history of white settlement, communities slaughtered and indigenous women taken and used as sexual servants. Isolated from their communities, the government introduced a policy allowing land to be claimed by white, European farming families. Land that belonged to Indigenous Australians. The Moore River Native Settlement is a regimented encampment, housing Indigenous children born to white fathers, taken from their communities under the belief that partially white children are superior and can therefore become disciplined servants for white families. Molly is a free spirited young lady and along with Gracie and Daisy, is determined to return to her elders and Jigalong community, the distance spanning over a thousand miles by following the Rabbit Proof fence. The Rabbit Proof Fence was constructed in the early nineteen hundreds to subdue the migration of rabbits into Western Australia from the eastern states and now becomes a beacon of hope and home. Throughout the narrative, transcripts and newspaper articles are included about the girls disappearance, only further verifying that the young Indigenous girls are little more than a commodity. Although the journey is harrowing and confronting, the terrain is breathtaking as the girls navigate the parched spiritual land. One of the loveliest aspects about Follow The Rabbit Proof Fence is the sense of family throughout our Indigenous communities and the respect for elders that is instilled in their children. 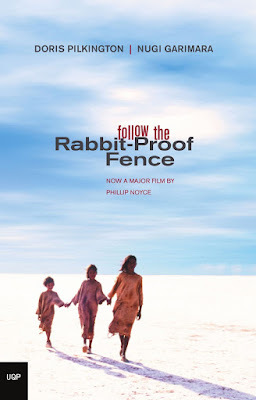 Follow The Rabbit Proof Fence is an integral aspect of Australian history, placing the importance upon the continuing treatment of our Indigenous communities and the destruction brought by white European settlement. A horrific historical narrative that is beautifully written and illustrates the strength and determination of three remarkable young girls. The premise reminds me of what happened to our Aboriginal children in the 60s. They also rounded them up, took them to the city to get "educated". Many broken families and up to now, it's still a disturbing history that the Canadian government have been trying to make up for (to no avail). It's basically the same ideals Joy, taking children under the guise of an education when they were taken to be educated enough to serve white settlers and make them feel comfortable. We have a national Sorry Day in Australia, but little to make up for the atrocities for white Europeans. This book sounds absolutely amazing. I've been on a historical kick, and I think this is just the kind of thing I'd like to read next. Thanks so much for sharing! It's such a wonderful read Alyssa, hopeful in a time where Australia has such a terrible and sordid history. I've seen the movie multiple times but for some reason I never realised it was a book too! I definitely want to check the book out to learn more about the terrible history and what the girls went through. There such a dramatic difference between the film and book actually. The film dramatises quite a lot and was directed by a white director. In the book, when the girls were taken from their family, there was no violence but pure grief. The mothers weren't assaulted. Just small idiosyncrasies but they add to the overall storyline. Thanks Anisha. It really is a must read for all Australians. I really should get the book!! The Movie adaption is one of my all-time Aussie favourites and the DVD sits on my shelf awaiting my boys being old enough to watch it and understand - yeah, a little ways off yet. I can remember sitting in history class and being horrified to think that if my grandmother had been Aboriginal this could have happened to my mother. The grandmother I’m talking about was born in Scotland, so she's white as and was never in any danger from the government. But It was the timeline that hit me and was how I connected to their pain as a teenager. Thinking on it now as a mother, it really is heartbreaking what those poor women and their children went through. It really is hard to be a proud Australian when you look at the putrid things those first whites did and the asshats they evolved into. It really was devastating and so many elders within the Indigenous community were never reunited with their families. I couldn't agree more Sarah, I love being Australian but what the white settlers did to our Indigenous population was absolutely deplorable. It's just one of many reasons that we should move Australia Day to any other day. It carries such a painful history. It certainly does Lily. We need more confronting reads that challenge us and our thinking and this is one book that I'd recommend the Aussie YA community especially to read. This book. This movie. We need so muany more stories like this in our lives. We really do. We need to be confronted with our own history, especially when the world is so US centric as well. I remember this movie when it came out but didn't realize it was based on a book. Why are we always so cruel and keep repeating the same mistakes?? I think it's just human nature to keep repeating the mistakes of our pasts because we don't listen or seem to learn. It doesn't help that some people refuse to see from others perspectives either. In Australia, I feel we're far more accepting than in the US but still have such a long way to go. Oh dear, I always thought it was just The Rabbit Proof Fence. I knew the movie was based on a book but haven't read / seen it. And I'm sure I should. I found the book was severely dramatised actually, the director is white and I've since read a few articles that the family weren't too happy with the adaptation. The incidents of the Stolen Generation are horrific but the novel is beautiful and ultimately hopeful. I think those who've seen the movie will be surprised when they read this one. Wow! Sounds like a must-read to me, as I've currently been obsessed with the topics of long journeys, history and cultures. Thanks for the great review Kelly! Thanks Michelle. It's such a wonderful read though. The incident although is not, but the journey of home that the three young girls find themselves on is so much more than the distance they had travelled. My goodness, it was inspiring. I know nothing about these issues of Australia. This would be an enlightening read for me. It's such a confronting read Resh but superbly written and a very important part of Australian history. I would love to see what you think of it.